You see them everywhere in San Francisco: luxury doggy daycares and hotels, dog gyms, dog spas, even dog bakeries. It’s pretty clear that San Francisco loves dogs. 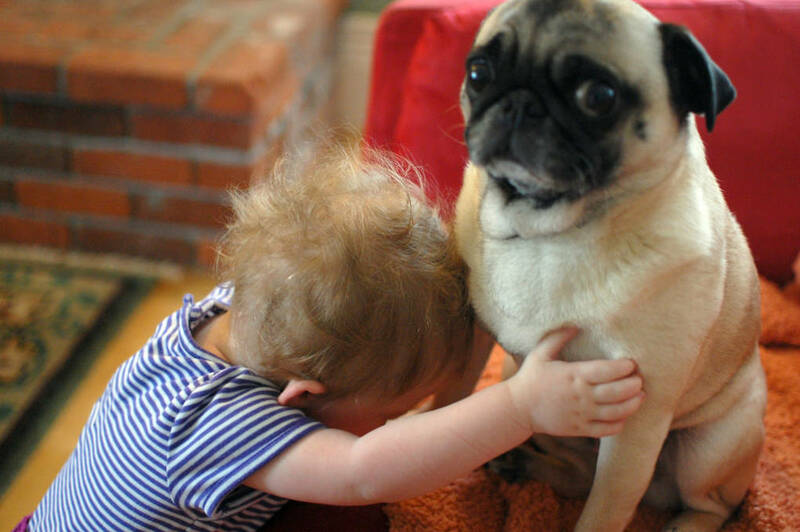 Today, in honor of our furry companions, we’re going to be answering a few questions about dogs. Do San Franciscans Have More Dogs or Children? If you’ve lived in San Francisco for more than a few months, you’ve probably heard the oft-repeated line: There are more dogs than children in San Francisco. But is it true? The saying is true! There are more dogs than children in San Francisco. However, getting into why there are more dogs than children in San Francisco is a bit more complicated. There Aren't Many Children in S.F. Turns out that San Francisco is not barking mad for dogs. It actually just doesn’t have very many children. San Francisco has the lowest percentage of children of any major city, according to U.S. census data. About 18 percent of households in San Francisco have children under 19, whereas nationwide the average is 29.4 percent. You might think it has to do with city life, but that isn’t the case. In Los Angeles, 33.4 percent of households have children, and in New York City it’s 30.5 percent. The only other city where fewer than 20 percent of households have kids is Seattle. Since 2010 there has been a slight increase in the number of children under 5, according to the U.S. Census Bureau. The question is whether or not the families of these newborns will stay in San Francisco. Housing is one factor that might determine whether young families stay. Since 2010, 61 percent of new market rate development has been studios and one-bedroom units, predominantly in larger buildings, according to the San Francisco Planning Department. So, despite the creation of new housing, the majority of it isn’t built for families. As for the family-friendly housing that already exists -- which includes dwellings of all kinds, from apartments to detached single-family homes -- currently only 30 percent of units with three or more bedrooms are occupied by families with children. Has S.F. gone to the dogs? 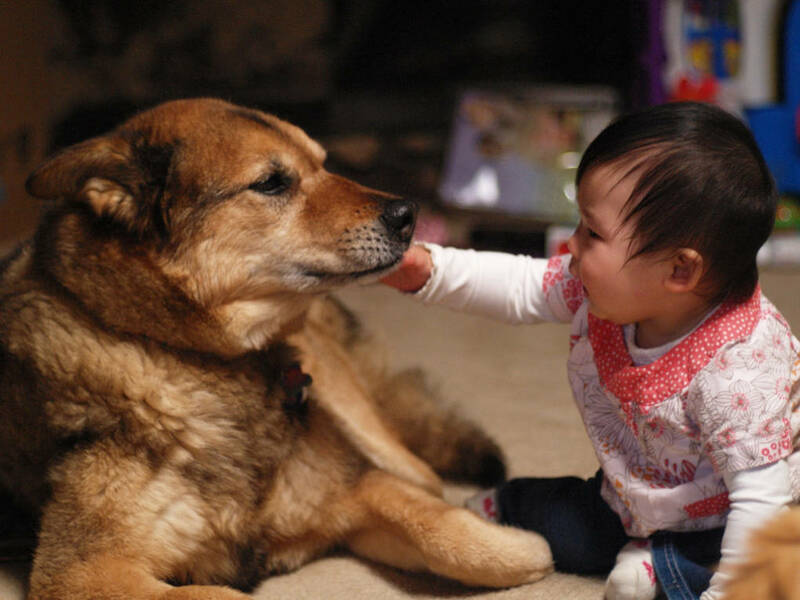 While we have solid data on kids, the data on dogs are harder to come by. Though owners are required to register dogs, very few do. Deb Campbell, spokeswoman for Animal Care and Control, says it estimates that fewer than 30 percent of dogs in the city are registered. To calculate the number of dogs in San Francisco, Animal Care and Control relies on an estimate based on how many people live in San Francisco. The American Veterinary Medical Association puts out one such tool. It uses survey data and census data to measure the percentage of people who are likely to own a cat, dog, horse or bird. Every few years it updates the formula, and is currently working on that now, said Assistant Director Sharon Granskog. However, such tools often rely heavily on national data. For instance, they estimate that about 1.5 percent of households in a community own horses, but there are probably not 13,408 horses in San Francisco. To get San Francisco dog estimates, Animal Care and Control uses several formulas to determine how many dogs are in the city. And lucky for us, there are other researchers looking into pet data, too. A Scarborough Research 2017 survey (a branch of Nielsen) found that while San Franciscans are certainly dog enthusiasts, they are less likely to own a dog than the average American. Tulsa, Oklahoma, may actually be the dog ownership capital of the United States. Meanwhile, Seattle is in a similar situation -- but with cats. The Emerald City has more households with cats than with children. It’s the only other city in the United States where less than 20 percent of households have children. Seattleites are 25 percent more likely to own a cat than the average American, according to the Scarborough Research survey. The Pacific Northwest as a whole seems to be the cat’s meow, with Spokane, Seattle/Tacoma and Portland all in the top 10 metro areas with the highest cat ownership rates. How Many Dogs Could You Fit on a Muni Train? This isn't a totally random question. Bay Curious listener Rona Kremer rides Muni Metro almost every day, and she often finds herself pondering one of the signs on the train. "[The sign] basically says that any number of service signal or guide dogs are allowed on the train free and unmuzzled," Kremer says. For years, she has wondered about this sign: Why is it there? And how many dogs could you actually fit onto a train? "There's got to be some limit to how many dogs you could stuff the train full of," she reasons. The sign itself is there for two reasons. One, it's the law. Both state and federal law prohibit public agencies from denying service or charging a person with a disability more to use their service, which means service animals must be allowed onto public transit. So if all public transit agencies are covered by the same laws, why does only Muni have such a sign while BART and Caltrain don't? Representatives at the SFMTA can't remember the specific incident that led the agency to put up the signs, but spokesman Paul Rose says it was likely the result of someone being told they couldn't bring their service dog on board because there were already other service dogs on the bus. 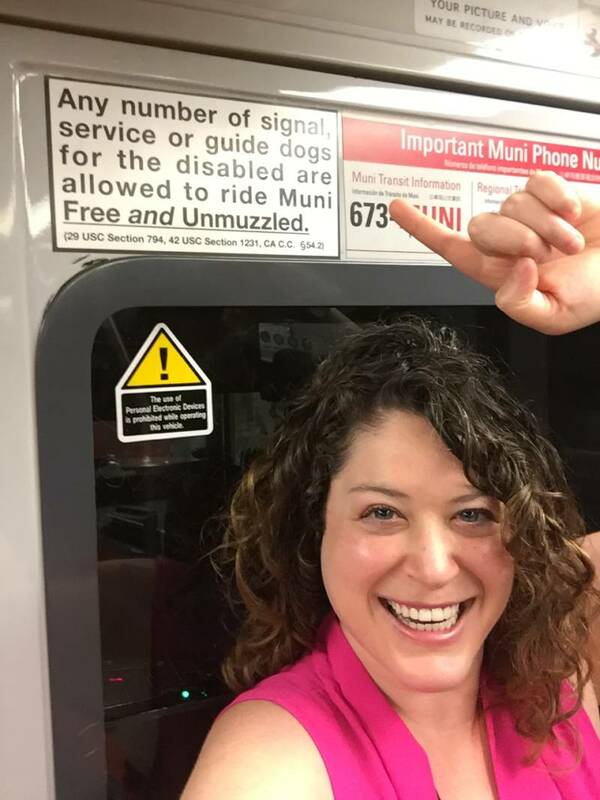 "Muni likely wanted to make it clear that all service dogs were welcome by installing additional signage," Rose says. 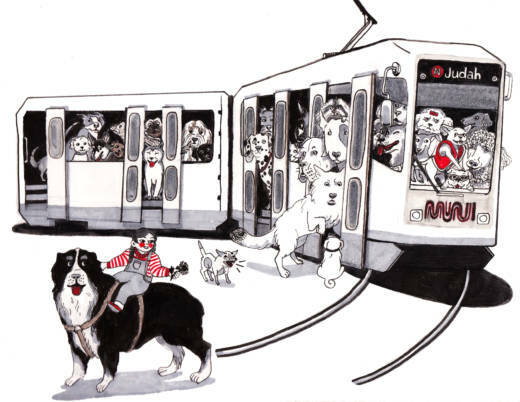 But what Kremer really wants to know is how many dogs we could fit inside a Muni train. She imagines it like a seven-layer dip of dogs. There are two ways to do this math: by weight and by volume. A Muni train can hold up to 50,000 lbs. Luna is about 12 lbs. That gives us more than 4,160 Lunas. To do it by volume, we have to imagine the seats have been taken out of the train and that Luna is a very flexible pup. With that in mind, the volume of a standard Muni train is 7,762.5 cubic feet. Luna is just a smidge over 1 cubic foot. This means we could fit 7,350 Lunas inside one train. "That's a solid number," Kremer says. "I like that number."